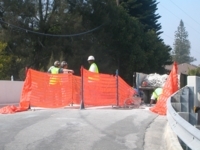 Construction crews for the Florida Department of Transportation last week closed the Crescent Drive humpback bridge to vehicle traffic while repairs are under way. Once repairs there are completed and the bridge reopens, crews will begin work on the North Bay Boulevard bridge. The projects should be completed by summer 2010, the DOT has said.